Mackenzie MacEachern played two games with the Rampage while the Blues were off for nine days. ST. LOUIS — Rookie forward Mackenzie MacEachern is back with the Blues after staying fresh with some action in the AHL. The Blues recalled MacEachern from the San Antonio Rampage on Thursday, two days before they resume play in Columbus following a nine-day break. 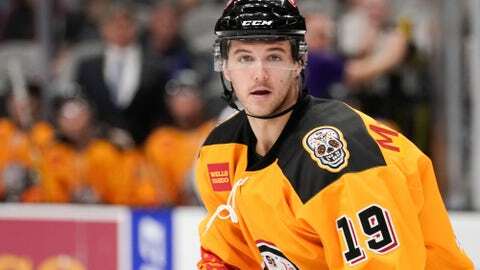 MacEachern, 24, played in two games for the Rampage, tallying one assist to increase his season totals with San Antonio to 16 points (nine goals, seven assists) in 33 games. He also has one goal and one assist in six games with the Blues.